Bring the energy of Pele into your life. Tonight we re-seed our internal / external forest so that our world grows back. We bring sound, & ceremony and exercises to re-create our world, mourn the old and plant the new. We will clear outworn patterns. Sounds of the Volcano will journey with us. During the Sound Bath, healing energy shot through my arm, and straightened it. I am healed! Amazing." 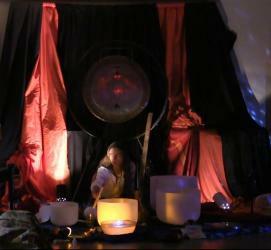 "The best sound bath I have ever attended." "When you worked on me, the Vertigo I have had for a year went away, it it is now gone." "It was beyond amazing - the instruments, vocalizations, singing, ceremony and vibe - Truly amazing!" Mari brought her gift of music therapy to our wedding. Her music is angelic, pure and so serene. Mari's music allows you to tune into your body, to experience things in such a raw form. To quote a powerful experience from one of our guests: "Your wedding has fundamentally changed how I see the world. I've removed myself from the pro-hunting community aside from a few personal friends. I'm seeing my relationships with people much more purely. I've sold my guns...I think you and your wife finally brought me home from war." 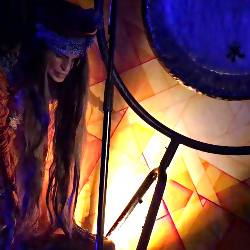 Mari's Sound Bath is beyond anything else, I experienced. It helped me to open up and connect to my deepest truth, it made me cry and it made me laugh. It is a journey that is unforgettable. Please, go and experience yourself. You will understand what I meant. "I have meditated for a decade with some of the greatest spiritual teachers alive but this sound concert aloud me without any effort, to go into one of the most profound, full body meditations that I have ever been in. It was extremely relaxing and unmistakably tangible. I loved the exotic instrumentation. A shamanic ritual can't be better than this!!! You don't have to believe anything, just be open. " "It was amazingly great! It was exactly what I needed to cross the bridge to my rightful life. " Excited for your next event Mari, wish to see you soon! The last one you had in Hollywood was spectacular! Certified Sound Healer, Mari apprenticed with Sound Healer K. Bach for more than 14 years, has written for one of the members of the Cirque du Soleil's solo show in Las Vegas, as well as sung harmonic vocals on the soundtrack for an MTV Animation Festival. Mari has an extensive background in Alternative Medicine. She has served as the medical Intuitive for Dr. Daniel Reeves, D.C., N. D., D.D., Phd. for 9+ years where she helped to diagnose patients in his practice as well as treat them. She also has studied Energy Medicine Modalities: Total Body Modification (Energetic Chiropractic) and Matrix Energetics 1, 2, & 3. She has Certification in all of these modalities. Further, Mari has a Certification to facilitate Kunlun Nei Gung or the Kunlun System, Taoist Internal Alchemy, since 2011. Mari has worked with Sacred Sound & Healing since 1991. Originally gifted a spontaneous form of movement meditation that came to her after attending a traditional indigenous "ghost dance" in 1992, she plunged into her own in-depth internal study of these mysteries, and her moon cycle following a spontaneous Kundalini awakening. She spent many years developing a relationship to this work in private. In 2008, she had a Spiritual Awakening. She teaches meditation and provides Sacred Sound & Sound Healing for transformation, health and stress relief.